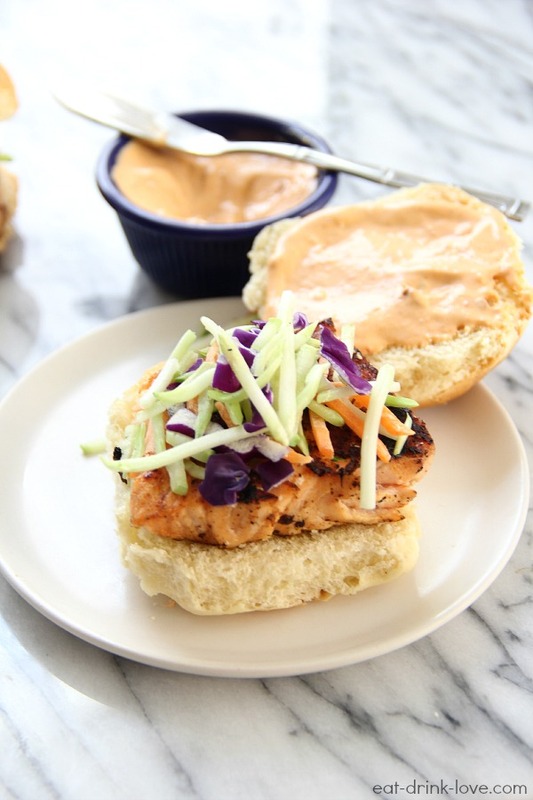 Grilled Salmon Sliders with Chipotle Mayo - Eat. Drink. Love. Whenever Lent rolls around I always try to think of new ways to enjoy fish. We do like fish in this house, but I tend to just grill it and eat it with rice or veggies which can get kind of boring after a while. I would definitely say salmon is my favorite type of seafood. It’s lean and works with a lot of different flavor profiles. It should be no surprise that I gave these sliders are southwestern flair. I mean, it only happens maybe like once a week on this blog. What can I say? We love these flavors in this house. 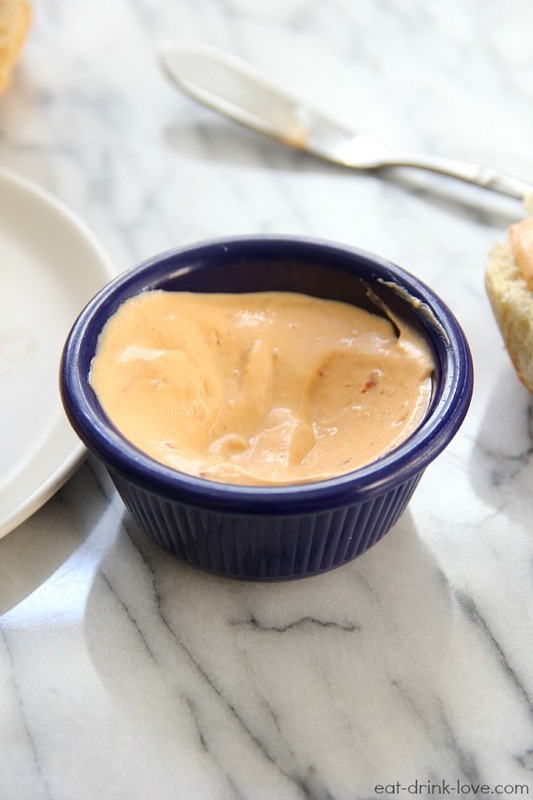 We also love chipotle mayo. I like to make batches to store in the fridge for sandwiches and it works so well on these sliders. And it’s actually the only thing I need to say to my husband to get him on board with a new recipe. If it has chipotle mayo, it has to be good. You can use whatever toppings you want, but I went with some broccoli slaw, it added a nice crunch to the sliders for texture, but typical burger toppings would work well too. 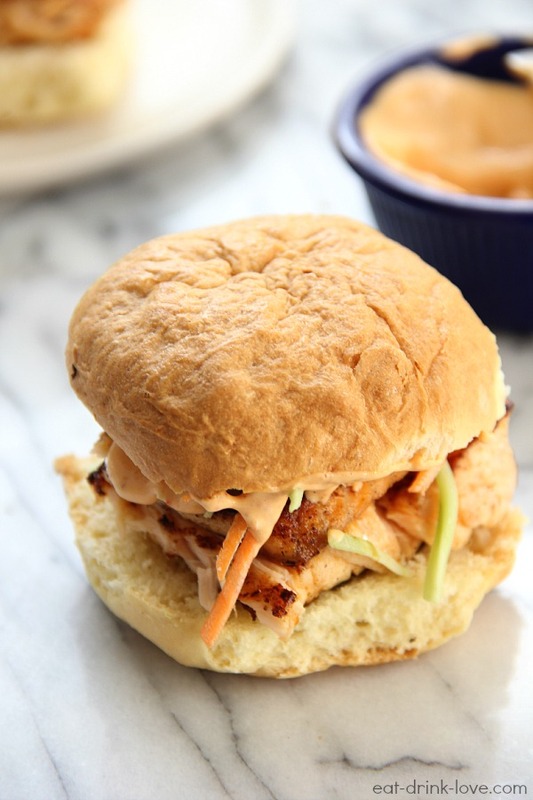 These salmon sliders are easy to make and perfect for a Friday night during Lent, or heck, any day of the week! To prepare the mayo, combine all ingredients in a food processor and blend until smooth. Set aside. In a small bowl, stir together the cumin, chili powder, and the salt and pepper. Heat a grill pan over medium heat. Drizzle about half of the olive oil on top of the fish (not the skin). Then sprinkle half of the spice mixture on top. Place the salmon skin-side down on the grill. Let the salmon cook for about 4 minutes. Then gently turn the salmon over. Take a fork or a knife and gently scrape the skin off the fish. Then drizzle the remaining olive oil and the rest of the spice mixture on the fish. Continue cooking the salmon for another 5-7 minutes or until it reaches desired doneness. Add fresh lemon juice. 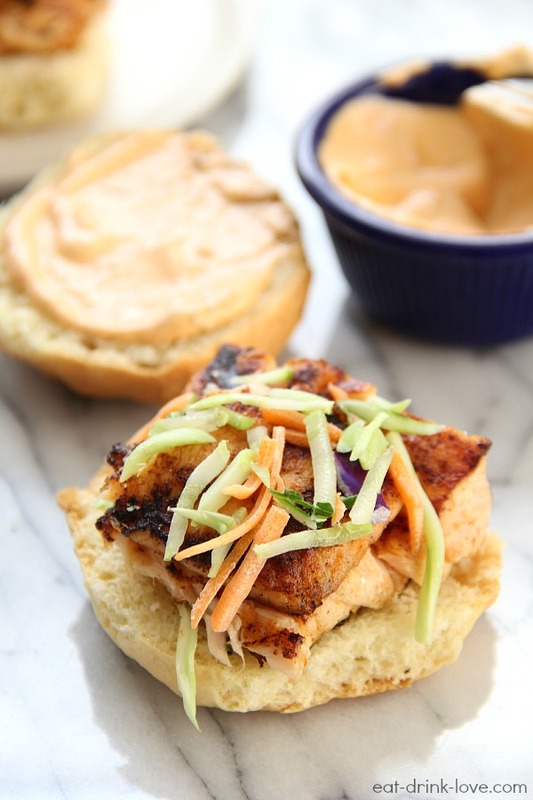 Then cut the fish into smaller pieces that will fit on each bun or roll. Remove from the heat. 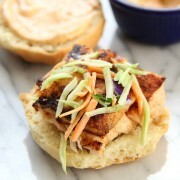 To make the sliders, place a piece of salmon on each slider roll. 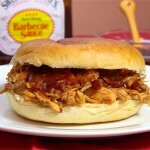 Add toppings and spread some of the chipotle mayo on the top bun. Serve. I am not providing nutrition information for this recipe because it can vary depending on the type of bread you use, the toppings, and the amount of mayo. Salmon is my favorite fish. I think I could eat it every day if it weren’t so expensive. These sandwiches look amazing. I need new recipes for fish too. My husband likes fish but he gets sick of my simple preparations. 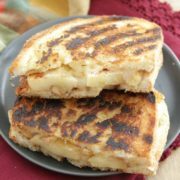 These are a great alternative to just plain grilled! Yum! Looks delicious and the photos are beautiful!! What a great fish slider. I’m glad you went with the southwestern flair because I LOVE IT. This sammie looks so fresh and flavorful. Love the crunchy slaw! 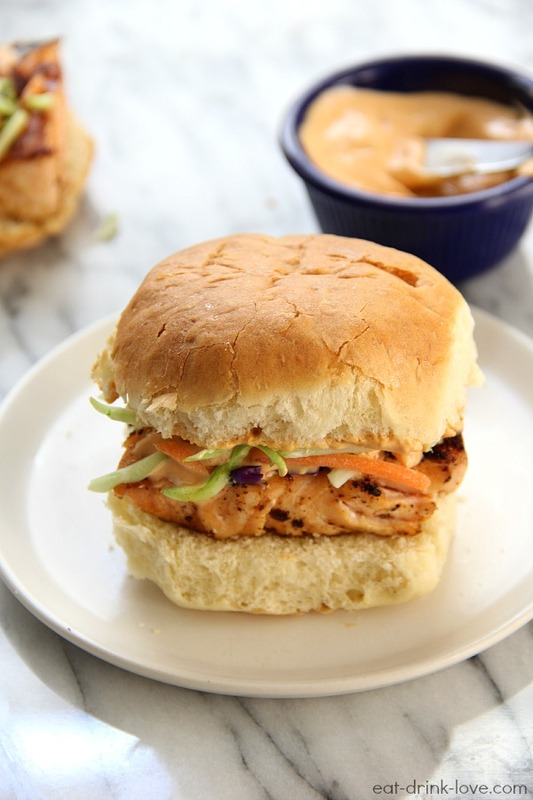 I’m pretty confident these salmon sliders will become a new favorite in my household! While we usually don’t eat fish, these look too good to pass up. And the chipotle mayo is pretty much out of control. PS I LOVE your new blog design, Stephanie! It’s adorable and so perfect for you! Chipotle mayo is totally out of control. What a treat. And oh em gee that sauce. I’d eat it with a spoon. It’s entirely possible I did eat some with spoon. So scrumptious! 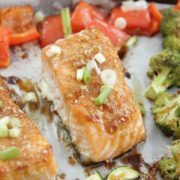 I love this tasty twist on salmon… we’re always looking for new ideas! I love everything about these! Going on the dinner menu for this week for sure. Thanks for sharing! What a treat. And oh em gee that sauce.